Impakt Festival 2013. Photo: Pieter Kers. The Impakt Festival is the annual culmination of the activities of Impakt as an organisation that specialises in critical media culture: a multi-media festival with conferences, talks, performances, screenings, exhibitions, presentations and music. 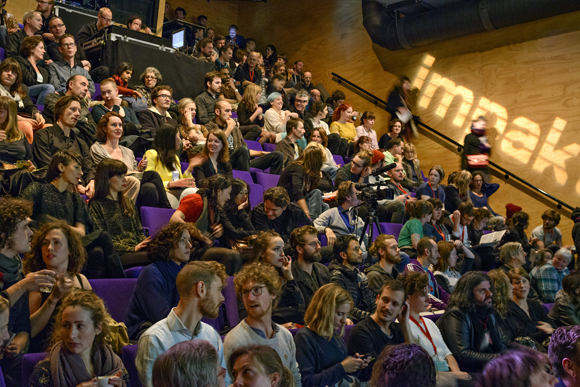 The Impakt Festival 2014 will take place from 29 October until 2 November at several locations in Utrecht (NL). Curatorial proposals can be submitted by curators individually or collectively and should revolve around this year’s theme Soft Machines (working title): Where the Optimized Human meets Artificial Empathy. Artificial intelligence is a concept that appeals to the imagination. The ‘Singularity,’ the moment at which computers become more intelligent than people, is a utopia for some and a nightmare for others. But what about the emotional and empathetic capabilities of computers and machines? Humans are naturally inclined to ascribe feelings to machines. At this point in time, robotic nurse assistants are already carrying out important work in nursing homes, and computers and mathematical models are playing an increasingly greater role in ethical decision-making. But when is there a question of the capability of real empathy? Can humans actually deal with robots that in terms of appearance and behaviour almost can’t be distinguished from real people? Is interacting with robots culturally determined? What happens when we increasingly computerize the world and the influence of humans fades away into the background? Under the influence of medical, psychiatric and sociological insights, human beings are increasingly being viewed as machines that can be controlled and improved. Are the complexity of our products and systems and the extensive computerization and ‘dehumanization’ causing an erosion of the material and ideological basis of our society? Machines might be resembling people more and more, but isn’t the real revolution taking place on the other side of the line, where the human psyche is slowly being changed by our interaction with computers? The curator or curatorial team can be responsible for the entire festival programme comprising films, lectures, new media projects, presentations, a music programme and an exhibition. It is also possible to submit a proposal for one or some of the parts of the festival programme. Read the submission guidelines here.